Register on-line or call 1-800-899-5111 for credit card orders. 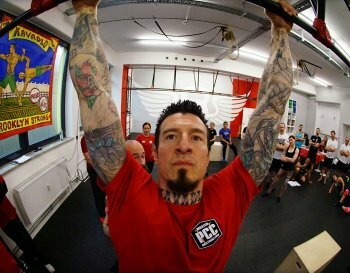 In 2013, Dragon Door established the PCC—the world’s first certification based on progressive bodyweight theory, designed by iconic author Paul "Coach" Wade (Convict Conditioning) and the world’s most widely-respected calisthenics instructor, Al Kavadlo (Raising the Bar, contributor to Train magazine, Bodybuilding.com, T-Nation, etc). 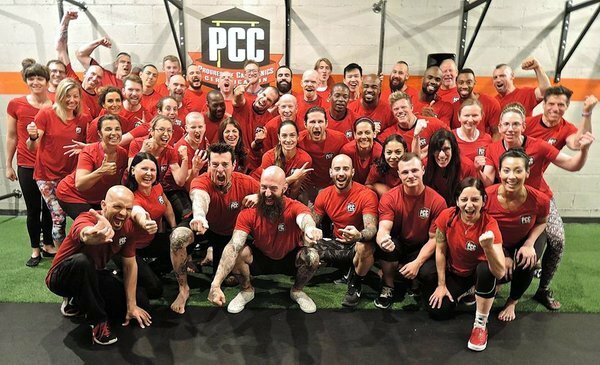 Taught by Al and Danny Kavadlo, the Progressive Calisthenics Certification (PCC) was rapidly hailed as the most advanced and powerful bodyweight workshop on the planet. 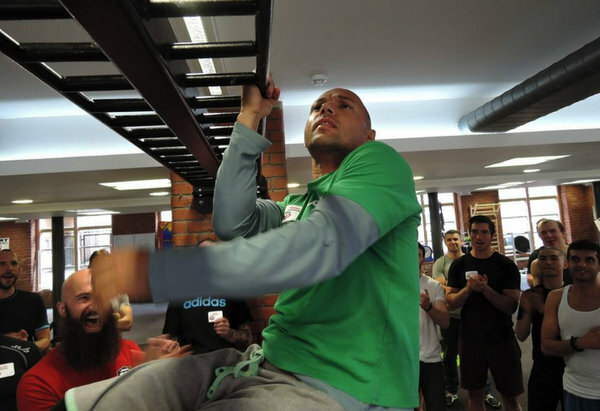 Participants were leaving the course having smashed personal bests, many achieving elite bodyweight feats they never imagined they could approach, such as the muscle-up, the one-arm pull-up, and the human flag! The PCC is an amazing experience: but it’s not an easy ride. It comprises eleven training modules and two packed seminars held over three full days. The work volume and the information load are massive, transformative. And the final certification test—The Century—taken after three days of hard training, ensures that only the exceptionally-strong will pass. After over a year of development, we can finally unveil the Strength Calisthenics Certification (SCC)—your chance to join forces with the ultimate bodyweight training system! BRIDGES: If there is a "secret weapon" to whip-like total-body strength and injury bullet-proofing, it’s the bridge family of movements. 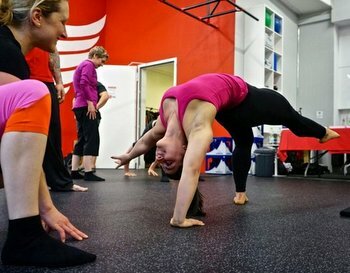 Yet virtually all trainers have a poor understanding of the art-form of bridging—in fact, most avoid it. Eliminate your weaknesses! 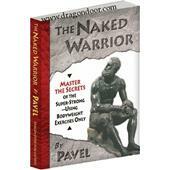 The opportunity to study all these cornerstone movements in-depth and in 3-D—while only inches away from bona fide masters of calisthenics—is absolutely invaluable, and will skyrocket your performance and understanding of these techniques in a way that videos or book study cannot hope to replicate. 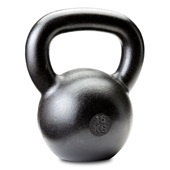 When you add to this the fact that participants will have the minutiae of their performance corrected by experts on all the basic movements, then you will see how athletes (and trainers and coaches) can make months—or even years—worth of progress in just one single course. 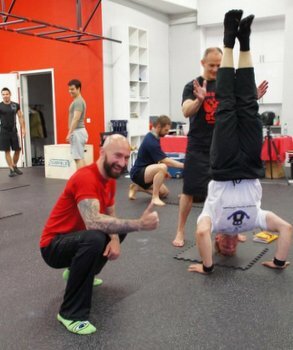 In addition, participants will get all the benefits of joining the industry’s largest and best-respected bodyweight training community, and get the chance to pick the brains of bodyweight instructors and aficionados from many different backgrounds. 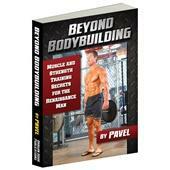 As a further added bonus, all attendees will receive a copy of the 400+ page textbook, The SCC Instructor’s Manual, featuring the full course syllabus and progressions, as well as detailed content on many different aspects of bodyweight training from kinesiology and mental conditioning to programming science. 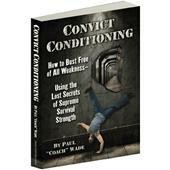 This special volume will only be available to athletes who attend SCC, so don’t miss out. Places for this unique certification will fill up incredibly fast—please book now to secure your place! 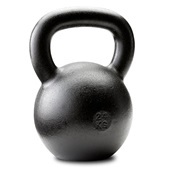 Squats must be performed from full extension of the legs to a point where the thighs are below parallel, or with the hamstrings resting on the calves. Push-ups must be performed from full extension of the arms to a point where the elbows reach 90 degrees of flexion. The legs, hips and trunk must remain aligned throughout. The knees must remain locked, with the feet together. 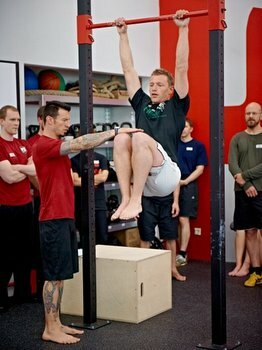 The pull-ups and bar hang must be completed with no part of the body touching the ground during the test. 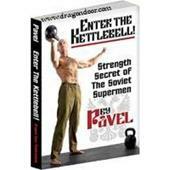 The repetitions of each exercise must be performed sequentially, with no rest or changing position in-between. Excessive bouncing or momentum are not permitted on any exercise. 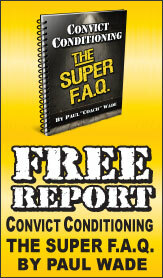 All repetitions must be completed in three minutes or less. The instructor in charge determines whether the test is completed fully; the instructor’s decision is final. In order to be certified you must pass all requirements. If you fail one of the requirements, you will have 90 days to send in a video to your instructor or visit your instructor in person to retest the requirement you failed. $50.00 fee for cancellations or transfers, no exceptions. This workshop limited to 50 participants. Workshop price does not include room & board or meals. A map for the location and a list of convenient hotels/motels will be provided to all registrants. Workshop sites may be cancelled up to 7 days prior to the beginning of the scheduled workshop session for any reason. When a workshop is cancelled or postponed, candidates will be notified immediately and will receive a complete refund of all workshop fees or be allowed to transfer at no penalty to the new dates or another course of their choosing without penalty. Refunds for credit card transactions processed online will be refunded back to the credit card within 2 weeks after the cancellation. If workshop registration was not completed online or the refund cannot be processed online, a refund check will be mailed within 4 to 6 weeks after the cancellation. If cancellation is required, Dragon Door is not responsible for any expenses (travel or lodging) incurred beyond the registration fees. We recommend against making non-refundable travel plans.